GPWA Times Magazine issue 43 now available online and at ICE and LAC next week! Thread: GPWA Times Magazine issue 43 now available online and at ICE and LAC next week! I'm pleased to announce the digital edition of the 43th issue of the GPWA Times magazine is now available online. The print edition be distributed next week at ICE London and the London Affiliate Conference. Please be sure to provide your mailing address if you would like to receive a hard copy (see details at the end of this announcement). 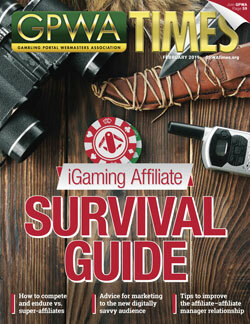 The new issue is titled the "iGaming Affiliate Survival Guide," because it features a series of articles from seasoned veterans of the industry who offer advice on how we should be adjusting to the times. Our cover story, written by Lee Gwilliam, VP of Operations at the Gambling.com Group, provides some advice for smaller affiliates about taking on the challenge of going head-to-head with super-affiliates in a mature, highly regulated market. AffiliateINSIDER founder Lee-Ann Johnstone is back with an article about strengthening the relationship between affiliates and affiliate managers, while Vin Narayanan discusses how affiliates needs to adapt their digital marketing strategies in order to appeal to a growing audience that doesn't remember a time without the internet or a mobile phone. Along with our usual departments including From the Forum, the GPWA Poll, APCW Wall of Shame and photo galleries from both the Lisbon Affiliate Conference and SiGMA, we also present in-depth affiliates interviews with Askana Radaman (GPWA member name Askana) from Belarus, Heather Gartland (Topboss) from South Africa and now living in New Zealand, and Tony Mace (BetSharks) from the U.K. For affiliate manager interviews, we speak with Valery Mukhina from Alpha Affiliates and Lars Roman from N1 Partners. GPWA Times Magazine - Issue 43. If you are not able to pick up a copy in person in London next week we are more than happy to mail you a hard copy of the new issue. All you have to do is visit www.GPWAtimes.org/subscribe/. If you are already registered on the GPWA site, then just click on the subscription registration link and fill in your mailing address information (you need to be logged in on the GPWA website) and we will mail a copy of the magazine to you. If you are not already registered on the GPWA website, click on the new member registration link first, fill in the information and visit the "My Magazine Subscription" page once you have registered. Once you enter your mailing address you will automatically receive future issues. We hope you enjoy the new issue and I hope to see you in London!